Indian officials are preparing for the upcoming US visit of Indian Prime Minister Narendra Modi that begins next week. Modi will hold talks with US President Barack Obama on diverse issues, including India’s membership pitch to the Asian bloc APEC and the Nuclear Suppliers Group (NSG), US defence manufacturers “making in India”, investment and trade ties and the global fight against terrorism, among others. Modi will also meet US Defence Secretary Ash Carter during his trip. The Indian Prime Minister reaches Washington on June 6. The two countries signed a civil nuclear agreement in 2005 during the tenure of Modi’s predecessor, Manmohan Singh. Singh had told Indian lawmakers that it marked the “end of India’s decades-long isolation from the nuclear mainstream”. The deal has been held up for eight years amid squabbling by both sides over who would be liable for any nuclear accident. No commercial agreement has yet been signed. India has announced plans to build 40 nuclear reactors, in addition to the existing 22, in the next two decades. BRICS ally Russia is also planning to build 20 reactors in India. Meanwhile, Narendra Modi will become the fifth Indian Prime Minister to address the joint session of the US Congress on June 8. 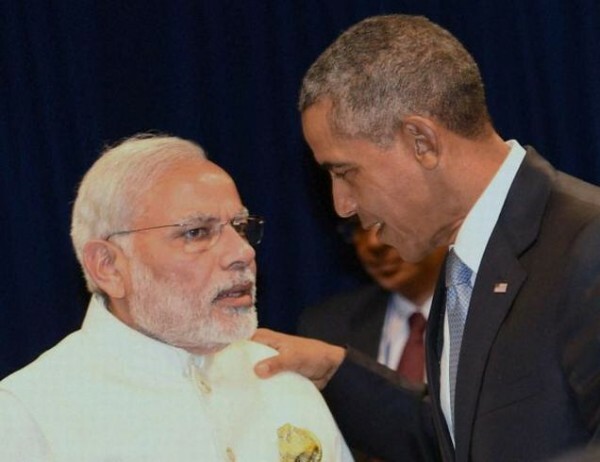 Obama will host Modi for a working lunch at the White House on June 7. The Indian Prime Minister will also address the India-US Business Council during his trip. The mood, ahead of Modi’s visit, was, however, soured by US senators raising several human-rights related issues that is bound to rankle the New Delhi administration. India needs to address issues like extra judicial killings, religious intolerance and human trafficking, US senator Ben Cardin said in New Delhi this week. A 2016 Global Slavery Index, quoted by Senator Cardin, names India as having the highest number of slaves in the world: 18.4 million. Meanwhile, US Senate Foreign Relations Committee Chairman Bob Corker, made some stinging observations at last week’s hearing on Indo-US relations. “How does a country like this have 12 to 14 million slaves in the year 2016. How does that happen?” Corker said. On Thursday, Indian Labour Minister Bandaru Dattatreya said the survey methodology of the NGO is “fallacious” and is an attempt to “tarnish” the country’s image. “We have strong disagreement with findings of Walk Free Foundation, which they have released with a catchy caption. At the outset, it is emphatically stated that we don’t have any instance of slavery in its conventional sense,” Dattatreya said in a statement. The US Senate Foreign Relations Committee examined ties between the world’s two largest democracies in advance of Prime Minister Narendra Modi’s address to Congress. Earlier the State Department supported US Commission on International Religious Freedom report charged India with increasing incidents of religious violence and a deterioration of religious freedoms in 2015. Modi’s visit to the White House assumes importance coming as it does during the final months of Obama’s presidency. India’s entry into the (APEC) grouping will likely be one of the “concrete” topics on the agenda of the Indian Prime Minister during his US visit, Arvind Panagariya, Vice Chairman of India’s top planning body, Niti Aayog said. “One concrete thing I hope would be on the agenda is India entering into Asia-Pacific Economic Cooperation (APEC),” Panagariya said in New Delhi. Trade ties with the US have grown over the years but US exporters to India have frequently complained of high tariffs and protectionist restrictions in the country. Two major American business bodies in January this year voiced disappointment with what they called the “glacial pace” of market reforms. In a submission to the US commerce secretary, the National Association of Manufacturers urged Washington to press for change during a visit by Modi in June. “Despite statements made by Prime Minister Modi and other senior Indian officials over the past two years, there has been limited progress in many key areas that make it challenging to do business in India,” the group wrote. Neighbouring China has become India’s largest trading partner.